What: AAA, Bangor School Department & Law Enforcement to remind motorist and parents about life saving tips to keep children safe as a new school year begins. Every fall, over 55 million children across the United States head back to school. With 13 percent of those children typically walking or biking to their classes, AAA warns drivers to be especially vigilant for pedestrians before and after school hours. The afternoon hours are particularly dangerous – over the last decade, nearly one in four child pedestrian fatalities occurred between 3 p.m. and 7 p.m. In 2015, across the U.S. there were 456 child pedestrians killed as a result of motor vehicle crashes according to Safe Kids Worldwide. That same year the Centers for Disease Control reported one of every five children under the age of 15 who were killed in traffic crashes were pedestrians. According to the AAA Foundation for Traffic Safety, a pedestrian struck by a vehicle traveling at 25 mph is about two-thirds less likely to be killed as compared to a pedestrian struck by a vehicle traveling at 35 mph. AAA’s School’s Open – Drive Carefully campaign was launched nationally in 1946 to help reduce the number of school-related pedestrian injuries and fatalities. The campaign kicks off each fall and continues throughout the school year to remind motorists to watch out for children as they travel to and from school. The campaign utilizes posters, magnets, bumper stickers, handouts, media outreach and other community initiatives. 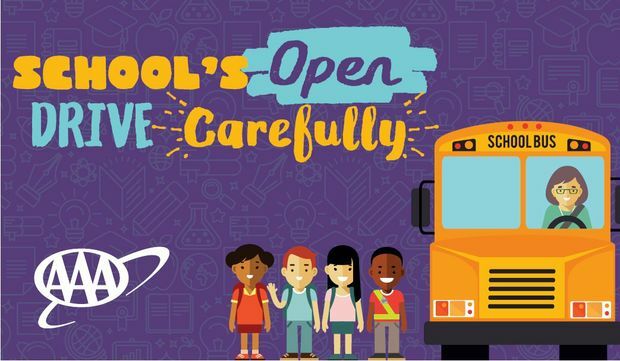 As part of AAA’s School’s Open – Drive Carefully campaign, which began in 1946, the Auto Club distributes more than 6000 pieces of safety materials to schools, law enforcement agencies and community groups throughout Northern New England.